For any resident of Colorado, Maroon Bells is an easily recognizable landmark. Nearly all gift shops in Colorado seem to have a post card or print available featuring Maroon Bells, typically with snow on the peaks, and a reflection in Maroon Lake below it. The scene is so popular that many people outside of Colorado are also familiar with it. The iconic scene was used by the state of Utah for tourism posters at one time, and it was featured in the logo of Molson Canadian beer. At the bottom of this article is some information about the crowds of people drawn to the fall colors at Maroon Lake this year. The popularity of the area brings millions of visitors each year, wanting to get their own photograph of the famous peaks. These 14ers also attract hikers and climbers hoping to summit the peaks. While such a beautiful location attracts so many visitors, the majority of them do not venture far from Maroon Lake, which is pictured above. For anyone willing to hike a little further, the Maroon Bells Wilderness offers an escape from vehicles and other mechanical devices. Planning a trip to Maroon Bells must start with thoughts towards transportation. During the summer, buses ferry hikers and sight seers up the last few miles towards Maroon Lake. If you are planning on seeing Maroon Bells from Memorial Day to Labor Day, plan on taking one of the buses up. If you want to backpack in the area, there are registration cards just past the lake. There is no associated charge, but the park service does like to keep track of how many people are actually using the back country. Make sure you get a good map of the area too, at right is the National Geographic series map for the area. I own several of the National Geographic maps. They are made from water and tear resistant material and have trails marked. If you aren't sure where to go, or you want a little more information about trail difficulty and what to see, consider getting a guide book. I have used Falcon Guide books for several parts of Colorado and can highly recommend them. 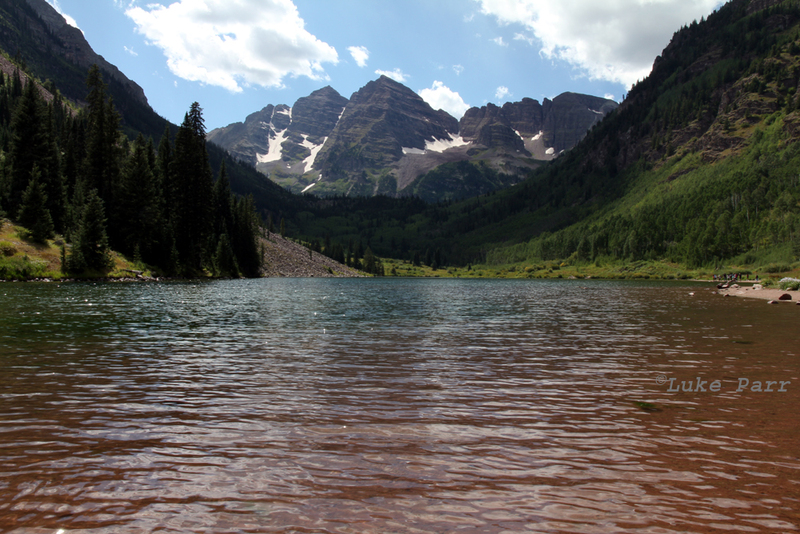 Wherever you end up going, be cautious, as Maroon Bells has earned the nickname "Deadly Bells." Because of loose rock and steep terrain, the Maroon Bells can quickly take the life of anyone that ventures beyond their experience level or anyone that isn't paying attention to their surroundings. For the average hiker, sticking to the established trails through the valleys will yield a beautiful, safe trip. For anyone looking to try climbing the Bells, make sure that you have experience with other locations and similar conditions. The Maroon Bells Wilderness is not a place for a first time climber looking to bag a 14er. Whether you want to see the iconic landscape from the typical vantage point, or if you want to trek deep into the wilderness, Maroon Bells has something to offer everyone. Let me know what you think about the wilderness area in the comment section below. As you might guess by the nearby town of Aspen, the area around Maroon Bells is famous for groves of Aspen that turn to beautiful shades of yellow and gold as the days shorten. In the beginning of October, 2011 the forest service reported that over 5,000 people traveled to Maroon Lake each day as the colors in the Aspen hit their peak. The beautiful colors certainly add to the picturesque view from Maroon Lake. Unfortunately the hordes of people have caused the Forest Service to re-think how they will allow access to that part of the National Forest. They may have to restrict vehicle travel or something along those lines to ease the pressure that it places on the natural resources. Hopefully we will all still be able to enjoy the views and the colors for years to come.